At 824 miles, 47,036 ft, the Pan Celtic Race: Shorter Route is still an awesome adventure through Scotland, Ireland and Wales that can be completed in less time, or riders can ride less per day. Not everyone has the time to commit to a full distance self-supported event. Perhaps you’ve never done anything like this before and want to dip your toes in before going for the full-on dive. 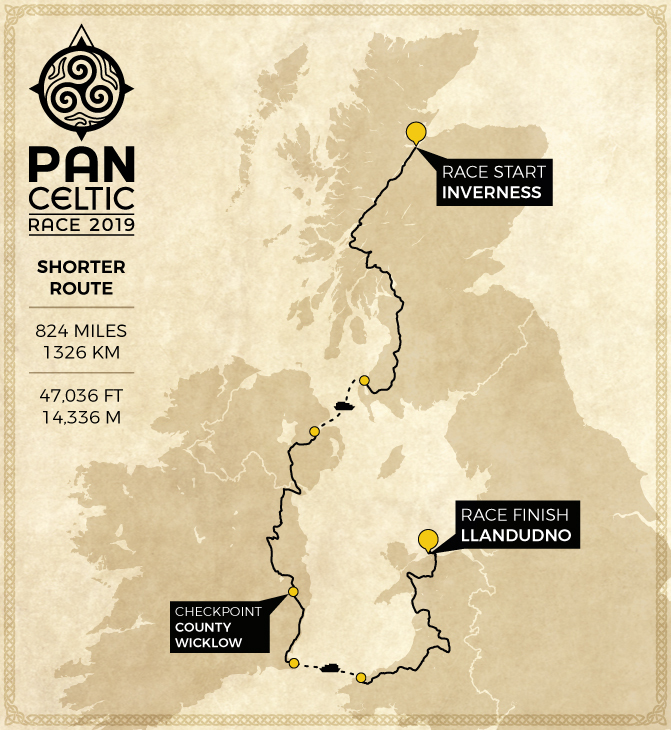 So here is the Pan Celtic Race 2019: Shorter Route, for those who feel less is often more. Make no mistake, this route will still stretch the most seasoned riders and prove a challenge for all. No matter your background or experience, you will need to do your training and preparation to ensure a successful ride. The shorter route follows a lot of the same roads as the Full route but leaves out certain sections. The same two ferry crossings are there to negotiate and one Control Point in Ireland for that welcome pat on the back! Scroll down for more information on each Shorter Stage route. Below is a Zip file download containing all 3 Shorter Stage GPX files. Stage 1 starts in Inverness, with riders beginning their adventure heading south along the east of Loch Ness, with spectacular views awaiting the first climb summit. The route winds past Loch Lochy and on to Fort William nestled amongst the mighty highlands. From here the road heads south-east taking in the scenery of Loch Lomond and onwards south through Galloway Forest National Park before heading west to the port in Cairn Ryan. For ferry times, please use the link to the Stena website timetable. Stage 2 starts in Belfast, home of the Titanic. The road heads south-west, taking in coastal views at Dundalk, before heading inland where sites of cultural significance are to be discovered, including the UNESCO recognised Newgrange. From here, the road continues South over the Wicklow Mountains where the riders will find a checkpoint. The opportunity to rest up, refuel and reset will be on offer, along with a firm handshake and a pat on the back, before heading towards the East Coast and the run to the final ferry crossing at Rosslare. Stage 3 starts in the port-town of Fishguard where riders will make the final push through hills and valleys rich in Celtic tales of dragons, leeks and sheep. Leaving the coast at their backs, riders will be greeted with quiet roads, picturesque valleys and topping out on high mountain roads. We head North East past ancient burial chambers and onwards to the beautiful Elan Valley and the awe-inspiring Devils Staircase. Snowdonia National Park awaits, with some of the greatest climbs in the UK including Llanberis Pass.